Sleuths is a mystery dinner show where the audience become the detectives. Step into a world of mystery and intrigue, mingle with the unusual characters and watch out for clues. The action is fast and the laughter contagious so you’re likely to be kept on the edge of your seat. Watch for anything suspicious, interrogate the suspects and help solve the exciting "who-dunnit" crime! Kids meals include chicken tenders, mac 'n cheese and green beans. Drinks: Unlimited drinks are served during the show including Bud, Bud Light, White Zinfindel, Chardonnay, Cabernet, Pepsi, Diet Pepsi, Sierra Mist, Mug Root Beer, Tropicana Orange Soda, Sweet Iced Tea, Brewed Unsweetened Tea, Coffee, Hot Tea. Gratuities are not included in the price. Groups of 15 persons or more will be charged a mandatory gratuity of $3 per person. This gratuity will be collected by your server locally. 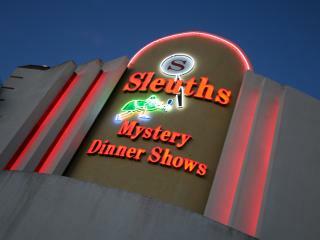 Sleuths Mystery Dinner Shows is located on International Drive. No need to request the exact time and date for your Orlando dinner show. Simply confirm a ticket with American Attractions and then ring the toll-free number detailed on your American Attractions voucher when in Orlando to reserve the date that best suits your party’s needs. American Attractions is more than happy to book a specific time and date on your behalf if this is required. Please Note: Tickets are not valid for the New Year’s Eve show on 31 December.